Death can be harsh on one’s career, or so it seems in terms of the long and productive academic life of physiologist Ancel Keys, Ph. 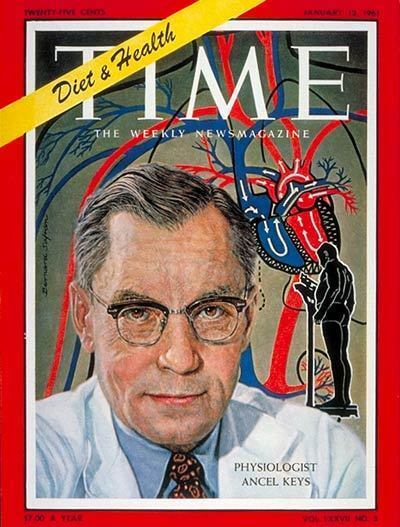 D. Celebrated at age 57 on the cover of this magazine on January 13, 1961 with an accompanying story about his quest to understand the root causes of heart disease, Dr. Keys continued his career for more than 40 more years. He died in 2004 at the age of 100, receiving international acclaim for his pioneering work. He led a team performing the Seven Countries Study (SCS) which was the first systematic evaluation of the relationship between lifestyle, diet and rates of heart attack and stroke beginning in 1957. This international study recently completed a 50-year follow up of participants and confirmed that cardiovascular disease is not the inevitable result of aging but rather a predictable and preventable malady in most. Keys was the man who developed the K (for Keys) ration to sustain troops in battle in WWII. His research on starvation is still used as the standard reference for the effects of starvation including eating disorders such as anorexia. And his 3 best-selling lifestyle books, co-authored with his lifelong partner and wife Margaret, herself living to age 97, introduced the Mediterranean Diet and lifestyle to the American public. Dr. Keys is best known for his research examining the relationship between diet, particularly fat intake, and health. This focus was launched after WWII with an examination of the health of executives in his hometown of Minneapolis. He went on to study this diet-heart hypothesis prospectively in many thousands of people in cultures with contrasting traditional diets, along with carefully performed metabolic ward studies of the effects of diet on serum cholesterol levels. The resulting Keys Equation, describing dietary saturated fats raising blood cholesterol levels and unsaturated fats lowering the same, broke new ground in understanding the origins of heart attacks. Of interest in light of the recent revelation that the sugar industry paid prominent researchers (but not Keys) to emphasize their findings on the effects of dietary fat, Keys early research was funded by dairy and meat producers. These manufacturers and Keys agreed to part ways when his research findings did not favor their products. RIP Dr. and Mrs. Keys. Or not so peaceful it seems. Social media and certain writers have not been kind to Dr. Keys in the last decade at a time that he cannot speak up and defend himself. If one references his Wikipedia entry, a journalist Nina Teicholz is featured commenting that if “strong personalities steer events using their own personal charisma, in the history of nutrition Ancel Keys was, by far, the Greatest Man”. This is not to be taken as a compliment and Teicholz is no fan of Dr. Keys. She would have us believe that it was his overbearing charisma and personality, and not hundreds of thousands, if not millions, of data points and miles flown across the world, that accounted for his influence. In reality, Dr. Keys had more than a dozen international and independent co-researchers in the SCS who formed and contributed to the research and writings that shaped the message surround the risks of foods high in saturated fats. Of further note, although since his death Keys is often accused of manipulating American food policy in the late 1970s, he never once testified before Senate hearings on the topic. Before turning away from journalist Teicholz, Wikipedia continues the defamation of Dr. Keys reputation citing from her book that “critics of Keys showed no correlation of dietary fat with heart disease, when more countries beyond Key’s original six were added”. In a popular You Tube, Teicholz accuses Keys of “fudging” his data. Of note, Teicholz acknowledges receiving honorariums from meat and dairy industry groups. Oh, how the dead Dr. Keys must be suffering her misguided attacks. So how did this celebrated and genius of a man (Dr. Keys received the highest IQ score awarded in his group of a 1,000 at age 18 in California) become the target of Teicholz and dozens of other bloggers like Dr. Joseph Mercola? No doubt, Dr. Keys was a strong personality. In the introduction to his fascinating book, “On the Trail of Heart Attacks in the Seven Countries”, Henry Blackburn, MD, a long-time colleague of Dr. Keys at the University of Minnesota, dedicated the book to Dr. Keys with the words “Ancel Keys, pioneering investigator, health revolutionary, and (usually) forbearing colleague who “discovered” the Mediterranean Diet and Lifestyle and introduced the idea of mass causes and preventability of heart attacks”. But being of strong personality alone does not make for the ill will and language that pervades social media in terms and the alleged “demonization” of saturated fats by Keys. The first apparent reason a dead Keys is the whipping boy of many bloggers is the oft repeated and consistently botched allegation that Dr. Keys omitted critical data in his early studies. Based in part on the observation that rates of heart deaths plummeted in countries like Norway during WWII, perhaps due to reductions in meat and dairy products, Keys began the first ever study of executives and risk of heart attacks in 1947, a year before the famous Framingham study began in Massachusetts. When invited to lecture at Mt. Sinai hospital in New York City in 1953, he presented a broad overview of the “Prediction and Possible Prevention of Heart Disease” later published in the obscure journal for that hospital. Included in his presentation was a graph of the relationship between the percentage of dietary fat and heart disease deaths from a governmental FAO database derived from 1948-1949. He indicated that he analyzed the data from 6 countries that had widely different dietary fat intakes and were not still recovering from the effects of WWII on nutrition. Critics have often erroneously referred to this as the Six Countries Study confusing it with the actual SCS. He also selected only countries that had reliable death records (e.g. Mexico did not have such death records). He presented a direct relationship between dietary fat intake and heart deaths and the audience was reported to be very receptive. Two researchers, Yerushalmy and Hilleboe, responded to Keys 1953 publication in an article 1957. They extracted data from the FAO database from 1952-1953 on 22 countries at a time recovery from WWII was more complete. They again identified a direct relationship between total dietary fat and heart related deaths, although not with the same statistical power as that reported by Keys. They further reported for the first time that foods of animal origins, particularly calories from animal protein, were the strongest predictors of heart related deaths. This is the report that Teicholz refers to in both her book The Big Fat Surprise and the Wikipedia biography of Dr. Keys. The allegation by Teicholz that there was “no correlation” in this later analysis is clearly erroneous. Of further note, by 1957 Dr. Keys had advanced his theories of cardiovascular nutrition significantly. He had spent the mid 1950’s touring communities in South Africa, Japan and Southern Europe with Paul Dudley White, MD, the world’s leading cardiologist and physician to President Dwight Eisenhower. These visits provided suggestive data that diet and lifestyle had an important role in the differences in heart attack rates. In fact, Dr. White commented that “a heart attack after age 80 is the work of God, before age 80 a medical failure”. By 1957 Keys was not worrying about FAO databases but was launching the epic SCS in Europe, Japan and the United States. Why did Teicholz write that “no correlation” was found by Yerushalmy and Hilleboe? This error seems to have originated with author Gary Taubes in his 2007 book Good Calories, Bad Calories when he wrote that “a critique of Keys’ hypothesis, noting that Keys had only chosen six countries for his comparison though data were available for twenty-two countries. When all twenty-two countries were included in the analysis, the apparent link between fat and heart disease vanished”. Oddly similar to Teicholz’s comments in her book years later, Taubes error has been repeated without fact checking over and over by dozens of bloggers favoring the consumption of low carbohydrate high fat diets. Another “criticism” made of Keys since his death is that he was a proponent of a “low-fat diet”. Indeed, the only dietary pattern shown to reverse coronary heart disease and events has been a low fat, plant rich diet such as those studied by Drs. Lester Morrison, Dean Ornish and Caldwell Esselstyn along with Nathan Pritikin. In any case, a cursory review of Keys research and cookbooks deny this epitaph. He included both the country of Finland and the island of Crete in the SCS. Both had diets with about 40% of calories from fat, hardly a low fat plate compared to the approximate 10% of calories from fat in Japan. Keys and his co-workers demonstrated that while the highest heart death rates in the world were observed in Finland in the 1960s where most of the fat was eaten as saturated fats in butter and cheese, residents of Crete had extremely low heart death rates but ate mainly monounsaturated fats from olive oil. Based on this appreciation that it was the type of fat, namely saturated fat, that related to levels of serum cholesterol and heart attack rates, the country of Finland launched the North Karelia project in the 1970s. This public health program educated the populace about replacing animal based saturated fat rich foods in fatty meats, butter and cheese with plant-based substitutes. This substitution resulted in a drop in the rate of heart deaths by 80% in 5 years, one of the most stunning and powerful public health campaigns ever launched. Keys and his co-researchers have been credited with saving thousands of Finnish lives, and indeed lives around the world, due to their contributions. towards Keys is that his force of personality buried the concept that sugar contributed to heart disease. A recent documentary by English cardiologist Aseem Malhotra was quite critical of the work of Keys (The Big Fat Fix), indicating that he had “demonized’ saturated fats. The film included a quote attributed to Dr. Alessandro Menotti, an investigator of the Seven Countries Study, alleging that “sugar was never properly discussed among us”. In fact, Dr. Menotti denies this quote (personal communication). Dietary sugar was always a target of research by Dr. Keys and his co-authors, including Dr. Menotti. With lower rates of obesity during most of the SCS, sugar was simply nowhere near as powerful a predictor of heart disease deaths as foods rich in saturated fats nor were there any plausible mechanisms for it to cause clogged arteries. For example, in the 25-year follow-up of the SCS the coefficient of correlation between butter and heart death was very strong at 0.9 while it was weaker at 0.6 for sugar and heart deaths. In 1971 Keys wrote a review of the data relating sugar intake and heart disease up to that time. He analyzed many arguments concluding that the scientific basis for the argument supporting sugars direct role in atherosclerosis was weak. Keys was however no fan of added sugar. In his 1959 lifestyle guide co-authored with his wife Margaret, Eat Well and Stay Well, reduced intake of sugar was one of the guiding principles of a healthy diet. In his 1967 book The Benevolent Bean he railed against the “scandalous” excess of sugar in the American diet calling for a reduction in sugar. This leads one to suspect that Keys’ critics, including Dr. Malhotra, have never read his writings on the topic. An understanding of the posthumous attacks on Keys may be understood by “following the money”. As reported by eminent Dutch expert in metabolism, Martin Katan, the worldwide dairy industry met in Mexico City in late 2008 and agreed on “working to neutralize the negative image among regulators and health professionals as related to heart disease”. One such health professional, Ronald Krauss, MD, spoke to the National Dairy Council on February 26, 2009 in Rosemont, IL on “Working Together”. Critics of Keys, including Malhotra, often rely on the Siri-Tarino “meta-analysis” published in 2010 by none other than senior author Dr. Krauss. Krauss and his co-workers were unable to verify a relationship between dietary saturated fats and heart disease. Rarely mentioned by critics of Keys is the lengthy critique of the Krauss study by Dr. Jeremiah Stamler, an eminent senior epidemiologist, in the very same journal. Another meta-analysis in 2014 that failed to connect saturated fats and heart disease was so flawed that the authors had to revise it and calls for retraction were made by Dr. Walter Willett, Chairman of the Department of Nutrition, Harvard School of Public Health. A resource used by critics of Keys is the PREDIMED study published in 2013. This large study evaluated a Mediterranean Diet enriched with either extra-virgin olive oil or nuts. Several of the researchers had received funding from both the nut and dairy industry. In a follow-up publication of the PREDIMED study in late 2015, dietary saturated fats predicted cardiovascular events and substitution for oils rich in polyunsaturated fats reduced cardiovascular events, consistent with Keys work. Indeed, in the last 12 months, multiple large observational studies have confirmed that when calculations of the impact of replacing saturated fats with polyunsaturated fats are performed, heart deaths decrease by about 25%. Furthermore, when animal protein is replaced by vegetable protein, far fewer heart deaths are also realized. Hardly evidence to demonize the work of Keys. A biography of Dr. Keys is being prepared by Sarah Tracy, Associate Professor at the University of Oklahoma. She wrote an editorial to the PREDIMED study in the New England Journal of Medicine in 2013 and stated that “the PREDIMED results would come as little surprise to the man behind the SCS (Seven Countries Study), American physiologist and epidemiologist Ancel Keys, who advanced the low saturated-fat Mediterranean diet for the primary and secondary prevention of heart disease”. The attempts to destroy the legacy of Keys, with undertones of financial motivations and ties to the dairy and meat industry sponsored pundits, should stop. It is, rather, a good time to acknowledge the important works of the powerful team of Ancel Keys, his wife, and colleagues around the world.